August saw the annual Military Pageant at The Shuttleworth Collection. 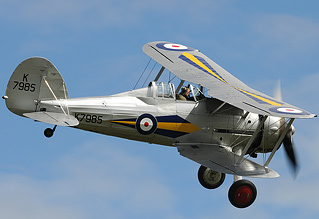 This regular show on the Old Warden calendar has a distinctly military feel and attracted a few welcome visitors to complement the based historic types. The weather was a blustery affair but luckily the showers due to hit Bedfordshire over the weekend seemed to miss Shuttleworth completely and a welcome spot of afternoon sun made for a very pleasant afternoons flying. Ian Matthews snoozed in the Biggleswade sun for UKAR. Additional photography by Steve Buckby. 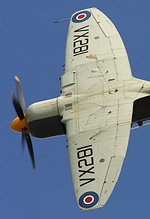 With the Collection's Spitfire LFVc still undergoing maintenance work in Hangar 1, it was up to the Old Flying Machine Company to provide an example of R. J. Mitchell's classic fighter design to open the flying display. The immaculate MH434 flown by Stuart Goldspink performed a majestic routine showing off the markings of 222 Squadron this LFIXc example proudly carries. It was a nice touch to land the Spitfire at Old Warden after the display and park up near the crowd line so everyone could have a close-up look at her. The Avro Anson took to the air to mark the start of the traditional 'guess the height competition' followed by a tidy display by the unique Westland Lysander. There's always some special formations at Old Warden and this Military Pageant was no exception. Clare Tector in the Tiger Moth managing the blustery conditions brilliantly to stay in formation with the Blackburn B2, then a formation flypast by the Polikarpov Po2, Avro Tutor and Hawker Tomtit got the crowd's cameras clicking. Then came a menagerie of military trainers - Piston Provost, Ryan Recruit, Miles Magister and Chipmunk. Continuing the training aircraft theme was another two-seater but this one packed a powerful Bristol Centaurus radial engine - the Hawker Sea Fury T20 of the Royal Navy Historic Flight. 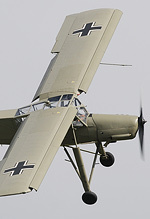 In complete contrast was the Fieseler Storch owned and flown by Peter Holloway. Once airborne, the seasoned pilot just turned the nose of this small German liaison aircraft into the strong wind which made the 'Stork' just hang in the air - an amazing sight. Want more unique formations? Shuttleworth has them to order! Time for the return of the Anson but this time along with the Gloster Gladiator and the Collection's gorgeous Hawker Sea Hurricane, all flying in a classic 'vic'. With the strong wind grounding the Edwardians and the delicate First World War types, this meant extra play time for the Hawker Demon and Hawker Hind. Topsides by the bucket load and first class formation flying showed off these two highly photogenic aircraft to the full. The pilots also looked like they were having enormous fun. What could follow the breath-taking routine by the Hind and Demon? The answer was arriving very low and fast from right to left along 'the bend' at Shuttleworth - it was 'Ferocious Frankie' ! 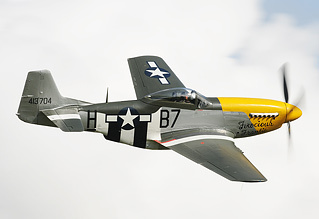 Presenting a full planform view of the Mustang on the first pass, Alistair Kay demonstrated the pure power of this Duxford based fighter in a unique series of rolls and topside flypasts. Plus to cap it all, another great moment as he landed the P-51 at Old Warden and parked up on the grass next to the sister OFMC Spitfire. So, the Shuttleworth Collection Military Pageant... Yes, it cost £30 to get in. Yes, the billed Lancaster and P-40 didn't turn up. Yes, the weather prevented the Edwardians and Great War aircraft from flying. But Old Warden on a sunny Sunday afternoon - priceless.